Malaysia has a rich colonial past and there are many intriguing stories relating to its trade wars, colonial occupation, communist insurgence and its independence. One of the intriguing stories is the mysterious disappearance of the Thai Silk King, Jim Thompson on 26 March 1967 when he went for a walk in the jungle. His disappearance attracted world wide attention on a highland station then only known to Malaysians and expatriates. While staying at the Cameron Highlands Resort, I wanted to take the opportunity to visit a trail that Jim Thompson walked, since it was relatively near the resort. The trail of course was named after him, after his disappearance. An initial scheduled program at 10am was canceled due to rainfall. It was replaced by a visit to the world famous Boh Tea Plantations. Just after returning from the tea plantations and following an invigorating spa session, there was an announcement to hike the Jim Thompson trail at 4pm. Needless to say, I had to skip the afternoon tea of delicious cakes, sandwiches and hot scones, not only for a much needed exercise but also to satisfy my curiosity of the mystery and intrigue surrounding Jim Thompson’s disappearance. That and my interest in nature meant that tea would have to wait. I quickly went to collect a raincoat, camera and put on my trusty pair of adidas kampungs – cheap rubber moulded black color studded shoes (with several bands etched on the side hence the reference to Adidas) infamously used first by plantation workers and now by seasoned Malaysian trekkers. It’s water proof and provides excellent grip on muddy trails but does not provide ankle support. Because it is rubber moulded, it’s easy to rinse off and dry. It’s a collectors item and rather cool souvenir if you ever visit Malaysia. Its very affordable. I have 2 pairs in the ‘limited edition’ white – with rubber studs and without, and am now searching for the rare brown version. Yes, a jungle fashionista! As I rushed from the room and into the waiting transport, I was greeted by Datuk Seri Wong Chun Wai and Datin Seri Florence Wong seated behind me. I hope I didn’t keep them waiting too long! They were in their sports attire and eager to get some exercise. I used to read Datuk Seri’s political and social observations column, On the Beat, in The Star newspaper, the most popular and widely distributed English written daily. You can find an archive of this work here. Never thought I’d be sitting in the same vehicle with him this close. 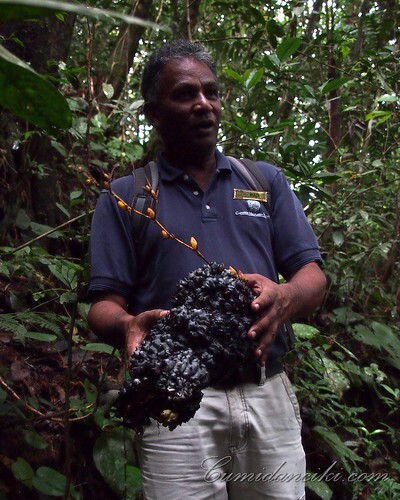 Our nature guide was Madi, a gentleman of Indian ethnicity born and bred in Cameron Highlands. After a 10 minute drive up a hilly road, we reached the trail head. Madi was a former employee of Tenaga Nasional, a government linked company providing electricity services to the country, he was also a farmer here, and a watchdog for environmental and social perpetrators in Camerons. He is semi-retired but decided to become a nature guide to share his vast knowledge culminated from having been born and raised here. During our 2 hour trail walk, besides sharing with us his knowledge on montane flora and fauna, Madi shared with us the tale of Jim Thompson’s disappearance which was probably what most trekkers wanted to know as well. There was the Thai Silk King’s former military intelligence past in World War II period and after, which tied him with the CIA (then Office of Strategic Services), the Japanese occupation, communists, and even the antique trade due to his connections with people of various ranks and influences. Thompson with his rich, colorful life could have been an Indiana Jones type of person, and his disappearance could have been the result of his connections to certain shady dealings. Madi even had accounts from key eye witnesses of Thompson being ushered into a waiting car near the trail and a helicopter waiting to take him away. Intriguing? Well you just have to come visit the Jim Thompson trail and meet Madi to get an account of his story yourself. 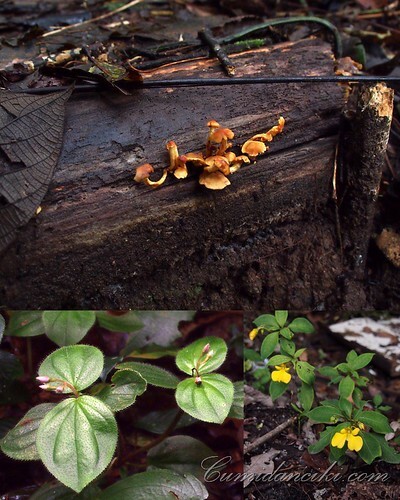 Madi talks about how ants contribute to the plant-flower regeneration in the jungle, keeping the eco-system healthy. 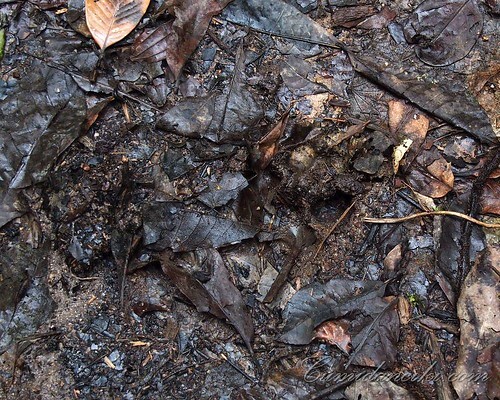 A family of black panthers lives in the area, Madi says as he points out several footprints at different sections along the trail. Getting back on the nature trail, Madi shared with us the ecological issues faced by the highlands which deeply affects the natives survival in the jungle. He highlighted the plight of the natives which he felt had long been a marginalized sector of society. Apparently the high usage of chemical fertilizer and unregulated diversion of natural water for farming use have affected the water supply for natives. Not only is there a low supply, but the contaminated water has led to health issues amongst the natives. You can tell how much Madi loves Cameron Highlands. He is a friend of the natives and often the middle person highlighting the issues faced by the natives and the highlands, that he is so deeply affectionate with. We ended our tour with a 30 minute stroll into the beautifully landscaped compound of the Lutheran Mission Bungalow then on to a windy downhill road back to the resort. A drizzle kept us company while Madi continued his conversation with us. 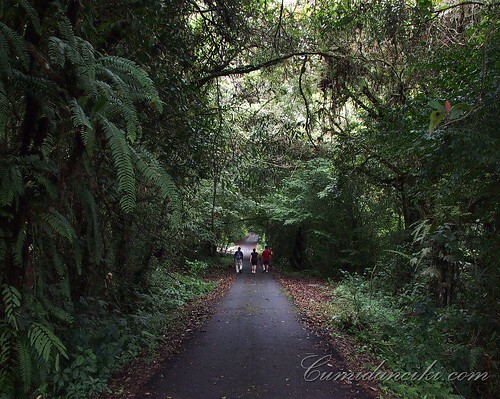 The stroll back to Cameron Highlands Resort. There are numerous jungle trails in here and around Camerons. While it is easy enough to walk along, it shouldn’t be attempted alone. 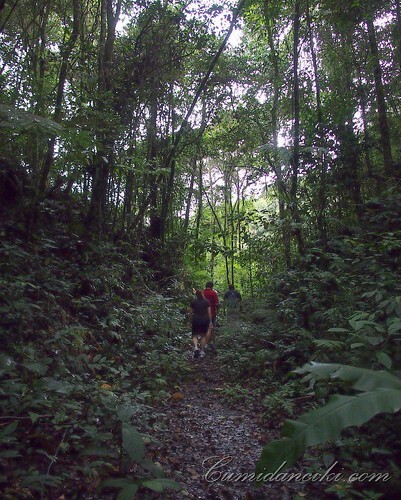 Even guides can get lost with the numerous trails that intersect each other, plus the confusing jungle foliage. I recommend having a guide familiar with the area not only for nature interpretation, but also to keep you company should your group end up taking a wrong turn. 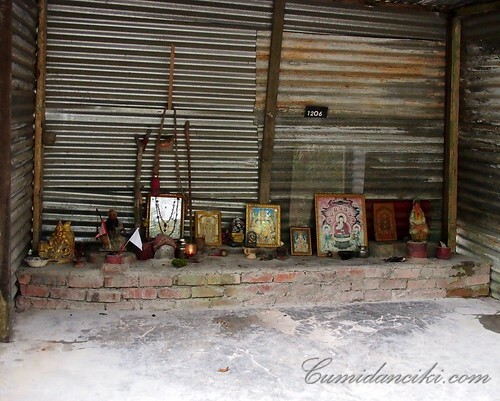 A Chinese altar by the road to ward off evil spirits and appease the gods and demi-gods. More information on the Jim Thompson Mystery Trail. Next articleLooking for 50 Lucky Winners! Win Free FlexiRoam Roaming Passes when you travel abroad! Oh no! Is anything being done for the water supply for the natives, then? not that we were informed. Camerons is the main vegetable producer for the country therefore the pressure for supply and low costs lead certain farmers to unethical means. We didn’t go on this trail the last time we were at CHR since we were told it was quite challenging and we had two elderlys with us. Got lots of mozzies ah? There are many trails, a guide will be able to design a route for you. No mozzies but we did have a can of insect repellent. Hi there – really loved this excellent post. We purchased a number of Jim Thompson silk products when we visited Thailand and remain impressed with the excellent quality and the beauty of the clothing. His story is quite interesting, and I applaud your efforts to follow the mystery! I wonder if we will ever know the answer – it’s sort of like the Amelia Erhart disappearance – intriguing. Thanks for dropping by. Will checkout your James Bond stories! off the beaten path indeed! sounds like a walk filled with mystique and mystery! glad you made it back safe and sound! love these nature walks. and with a touch of history and mystery..its really a good one. never taken this “trail”. will check it out when we head in to camerons in june. that’s big tourist season! but you can escape the touristy areas with a walk here. Very well written post which nicely meshes the history and nature aspect of the Cameron Highlands. This is a place I would like to visit when I come to Malaysia. I wasn’t very good at maths but i think the equation makes some sense. Camerons is only a bit of it. This looks lovely – really want to go there. And fascinating stuff! As a regular traveller to Bangkok/Thailand, I’ve always been intrigued by the Jim Thompson disappearance. Hey intriguing story (for me at least) read a lot about the OSS, got a lot of books like that from Amazon in the past. Nice to see that there’s heaps to do in Camerons besides the usual touristy strip. Very interesting post. Will try and do this trail. 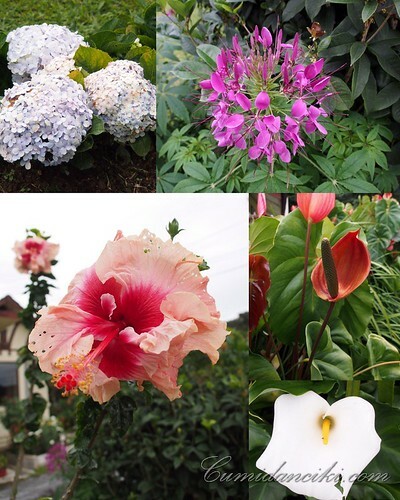 Love Malaysia’s beautiful fauna and floral. Looks like an awesome hike! And worth missing high tea for 🙂 Thanks for the tip on adidas kampungs– I am looking them up now! The Bigger, Better and Bubblier Sparkalite ‘4Cs’ Sunday Brunch @ InterContinental KL !